2012 Green GOOD DESIGNtm - Green Urban Planning / Landscape Architecture category. 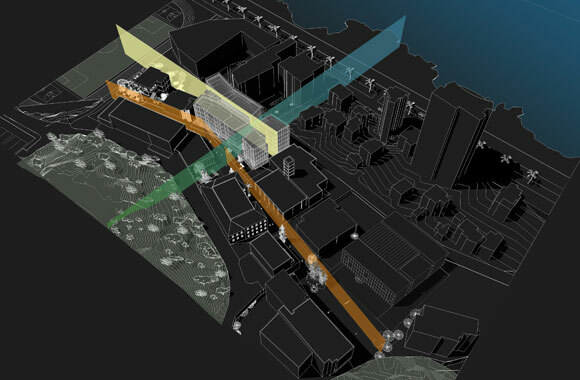 This cutting-edge research complex is the first major construction within the new strategy for the regeneration of the university’s Engineering District. 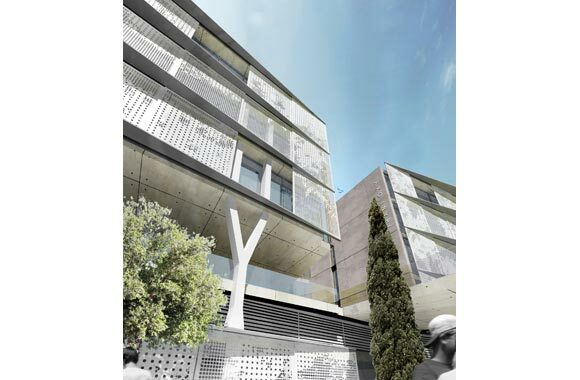 The project’s objective is to invert the tendency of perceiving the district as the backyard of the lower campus and transform it into an ideal setting for the development of future architects, designers and engineers. The required attitude is to create a setting conductive to learning-by-example; a well designed, well thought, and well executed construction, in tune with the ambitions of the American University at large in providing high excellence in education. The IOEC establishes an exemplary model that will not only trigger but also guide future development in the vicinity at large. 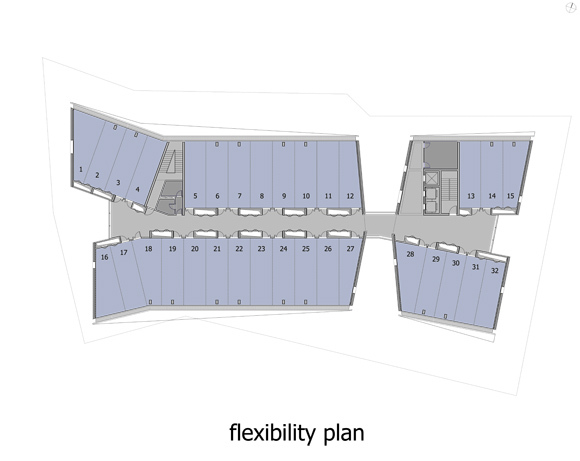 The IOEC building offers a pragmatic massing solution creating twin, bent and sculpted linear ribbons of labs paired around an intelligent circulation and technical spine. By running East West, the two ribbons capture the essence of the site: an unmatched northern see view and, to the south, a most singular panorama of the campus’ lush and steep natural ridge. A deep and full height cut through both ribbons reveals the circulation spine at its thinnest point and creates a dramatic double-sided “urban window” culminating the project’s visual experience. It brings both the Campus and the Mediterranean straight into the heart of the building, at every floor, and at every journey through the project. 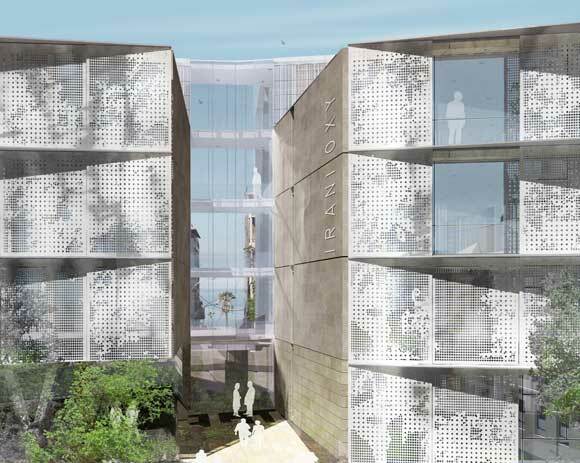 The thin transparent urban window bridges the visual gap between the upper campus and the sea, and, conversely, frames the symbolic University Clock Tower from the corniche. An intelligent service and circulation spine forms the central nervous system of the project, channeling both its networks and users. In addition to its basic function of visually and physically stitching the project together, the spine houses the complex system of vertical shafts enabling all the laboratory spaces to be directly supplied with a panoply of vital electromechanical services. The spine is first the irregular void that it is left between the two linear masses of lab volumes; it expands at the tips to create generous student gathering spaces with natural light and serene views. Its great potential is in its ability to give the whole building a vibrant way of working, its transparency maintaining a buzz of activity that reflects the excitement behind some of the work achieved within the labs. A structure-free floor plate of about 1500sqm provides all the required flexibility to group lab modules and shift partitions. 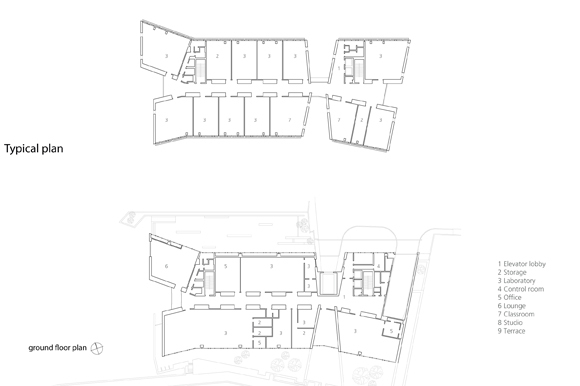 The distribution and combination of the laboratories and workshops required by the program follow a simple logic: each basic lab module (3.40m wide, 10.20m long) is designed to be individually connected to the spine, and thus has its own access, shaft, and natural ventilation and light on demand through the active, intelligent skin. All labs created are in that sense autonomous and flexible, able to be (re)combined and technically upgraded with ease. This means the building, true to its function as an engineering research facility, is future-proof and ever evolving with new technologies. A main grid of pillars splits in two on its way up the building, its elements getting lighter as they shed weight on the upper floors. It optimally serves with its bottom single bearing points and larger spans the more demanding lower technical and parking floors before doubling up for a reduced lateral span on the lab floors. The location of all pillars on the periphery of the building and along the central spine completely free the floor plate to allow the lab modules to be combined at will over a seamless 60 meter expanse of space. 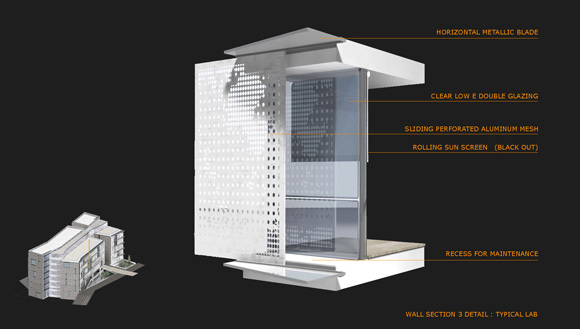 On the north and south, an interactive double skin is clearly expressed with its first layer of clear low solar transmittance glass, shielded in turn by perforated aluminum sunscreen panels. These panels can be moved on horizontal tracks between stainless steel canopies, allowing for a personalized degree of filtered visual and thermal protection throughout. The relatively straightforward screening system is easily operated by hand. Unlike fixed louver systems or fixed screens – where the thermal benefits come at the cost of never escaping the “looking through a cage” feel – IOEC’s double skin allows the users to simply slide the panels aside and get uninterrupted floor to ceiling views. 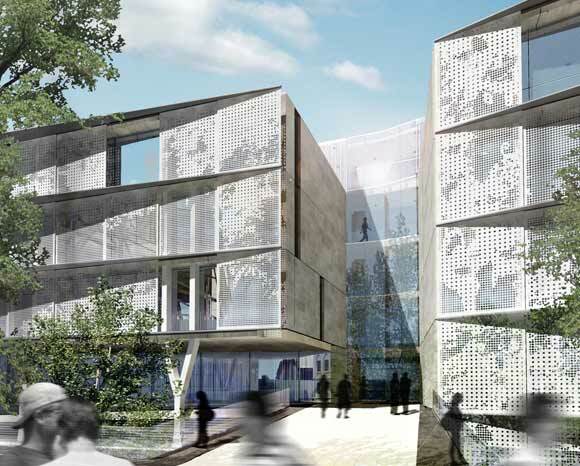 The panels are designed with a foliage pattern, borrowed from campus trees, without disrupting the harmonious expression of the building. They permit different degrees of perforation, in reaction to orientation, views, and labs’ light requirements. The glass windows are operable where needed for natural ventilation, and a gap between them and the sliding panels allows easy access for maintenance and cleaning. The final and third layer of shielding is provided by light rolling sunscreens on the inner face of the glazing. These allow further light filtering where required, all the way to complete black out. 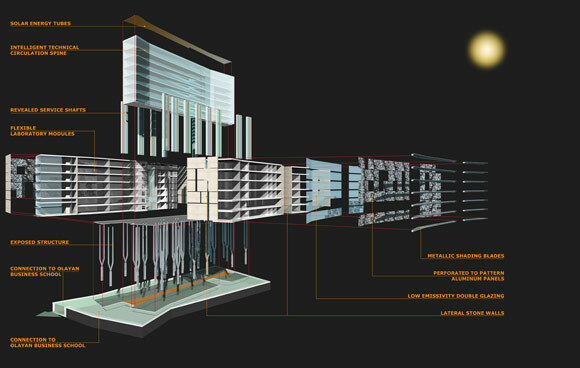 The multi-layered skin offers a new image to the campus and the engineering school. Cutting edge technology made visible at night through the metallic leaves of its panels, shimmering along the lowest border of the campus, interacting both with the city and the university grounds. The perpendicular east and west facades are massive insulated stone clad walls that cut through and frame the building. 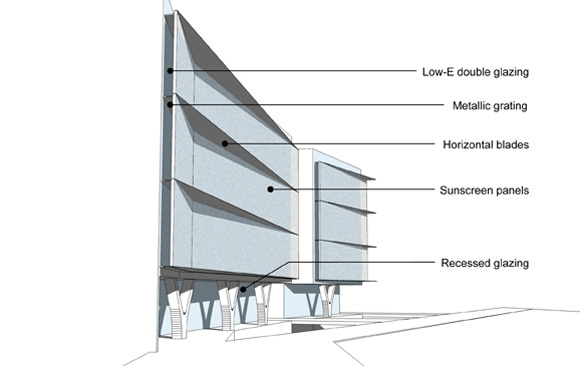 Inserted in them are, narrow and full height slits that open the views in specific directions while shielding the labs behind from the low sun rays. These openings have deep protective reveals created by the accentuated recess of the glazing from the face of the façade. Locally-sourced pale yellow limestone subtly brings the building in harmony with the historic buildings on campus. 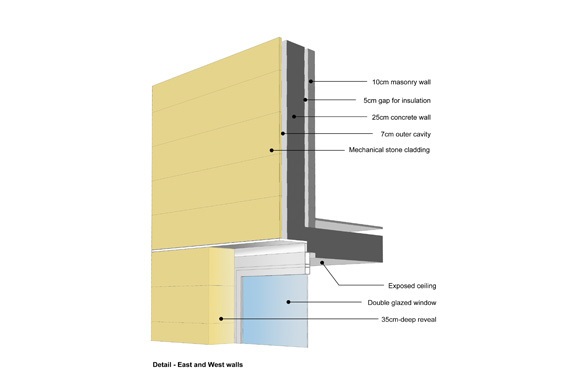 Particular attention is given to the use of passive engineering techniques to stabilize environmental conditions, improve comfort and reduce reliance on active building service systems. 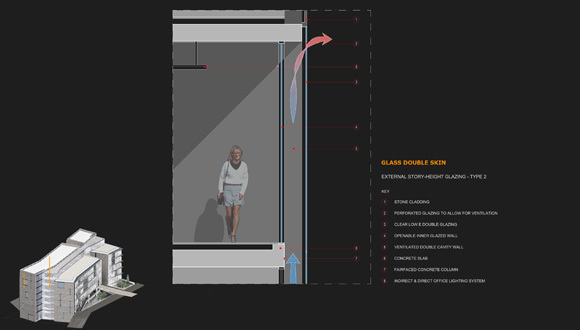 Given that IOEC is situated in a hot Mediterranean climate, the design of an intelligent double-skin system on the main facades prevents direct sun rays from reaching the glazing while still ensuring maximum visibility. All the building’s regularly occupied spaces receive ample natural daylight without the associated heat, which promotes occupants’ indoor comfort levels, minimizes cooling loads, and drops electricity consumption via artificial lighting. The project’s exposed heavyweight concrete construction coupled with a night-cooling strategy provides good thermal storage properties and offsets daily temperature fluctuations. 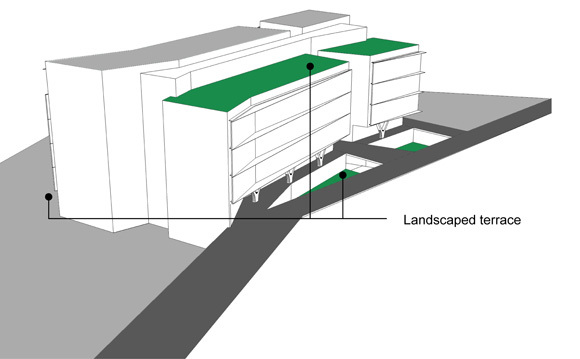 Moreover, The IOEC’s rooftops as well as basement roof sections incorporate extensive vegetated areas where a native non-invasive planting scheme is implemented. In parallel, water collection, conservation, and recycling considerably reduce water usage for both irrigation and flushing. Total energy recovery units installed on the building’s central air handling system significantly reduce the amount of energy needed for mechanical ventilation and air conditioning. Finally, roof solar collectors for lighting and heating contribute to the overall eco-friendly quality of the research facility. The IOEC building is the first project in Lebanon registered for LEED-NC Certification, and is expected to earn the Gold rating upon completion.